Could you explain more about the "unglazed support points"? Do they reveal firing methods specific to a period/country or the way they were stacked in Saggars? Thank you for enlightening me on this. Shelley, the Chinese for this is 支釘. They were also used in China. If you do a search for this you will see many more. They are different size. Those most often used in recent centuries are about the the size of a sesame seed. If the whole bottom is glazed, including the foot rim itself, the item stands on these support points. They are knocked off after firing. When the item stands on an unglazed rim they are not required. Japan is known for having used these more frequently in the Qing dynasty, and the points are often slightly larger. I don't know the collecting value of this, could be old, but do not know how old. 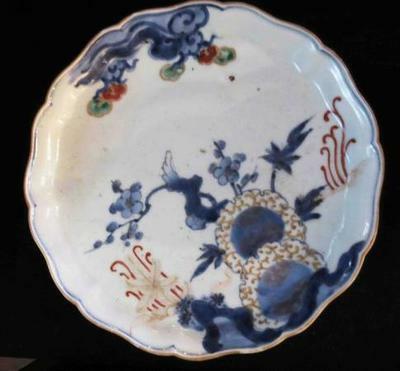 A Japanese porcelain specialist might be able to help. 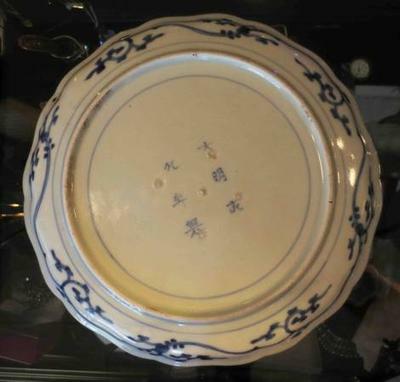 The Chinese Ming Chenghua mark is frequently found on Japanese porcelain. The rim decoration looks Japanese, but before all the (five) unglazed support points in the middle of the bottom are invariably a sign that it is Japanese. Could be an Imari decoration.